Today, Brian Kemp became the 83rd governor of the state of Georgia. The inauguration of Brian Kemp as the 83rd governor of the state of Georgia began Monday with a prayer service at 10 a.m. at The Cathedral of St. Philip at 2744 Peachtree Road in Atlanta. The Georgia governor's race between Republican Kemp and his Democratic rival Stacey Abrams was among the most hotly contested in the nation. A final decision in the contest did not come in the hours following the closing of the polls, but days later, after the counting of absentee and provisional ballots and amid the threat of lawsuits. Once Kemp was able to claim victory, some ten days later, he said it was time to move beyond the contentious campaign and promised to address public education and small business across the state during his administration. Governor-Elect Brian Kemp's formal swearing-in ceremony will take place at Georgia Tech's McCamish Pavilion at 2 p.m. The inaugural ceremony traditionally takes place on the steps of the Georgia State Capitol building. This year, the ceremony will occur indoors. When the formal ceremony begins, honored guests are first recognized in order by the public address announcer -- members of the Georgia Consular Corps, Justices of the Georgia Supreme Court, Georgia Court of Appeals Judges, Georgia's Public Service Commissioners, the Mayor of Atlanta and her husband. This is followed by the arrivals of the state Insurance Commissioner, state School Superintendent, Agriculture Commissioner and Attorney General and their families. Finally, the PA announcer will formally introduce the incoming governor, "Ladies and gentlemen, the Governor-Elect of the State of Georgia, Mr. Brian Kemp and Mrs. Marty Kemp." Governor-Elect Kemp and Mrs. Kemp will make their way to the front-right of the stage. Once everyone is seated, House Speaker David Ralston will welcome the guests and formally start the official ceremony. Everyone rises for the presentation of the colors by the Georgia State Patrol, followed by the National Anthem and exit of the color guard. Guests will remain standing for an invocation. The "Passing of the Seal" Ceremony takes place at this point. The Great Seal of the State of Georgia is used to authenticate official government documents executed by the state. The seal itself is defined in Georgia law with the three-columned arch from the state's coat of arms and the date of incorporation. The reverse side of the seal has an image of a ship bearing the US flag symbolizing Georgia's export trade. A smaller boat represents the state's "internal traffic." On the left side of the image, a man can be seen plowing a field with a flock of livestock. The motto, "Agriculture and Commerce, 1776" is inscribed on the outer ring of the image. Gov. Deal, as outgoing governor, will officially present the seal to outgoing Secretary of State Robyn Crittenden. She will, in turn, present it to Governor-Elect Kemp, as incoming governor. This is followed by a 19-gun salute that is presented by the Georgia National Guard which has been pre-recorded and played on the jumbotron. Following this, Gov. 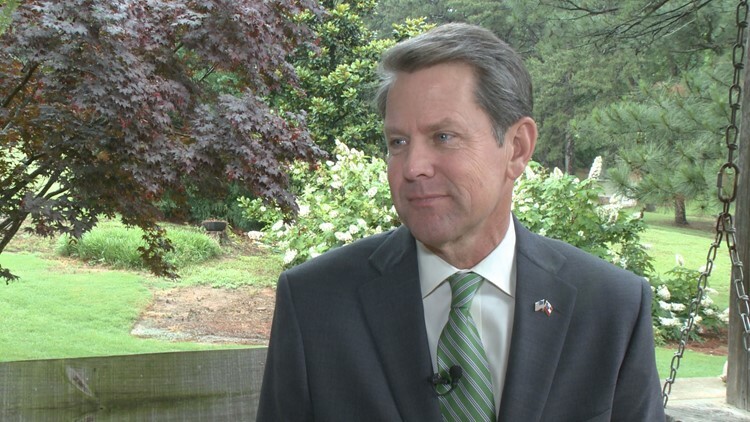 Kemp will deliver his inaugural address. The ceremony will conclude with a benediction. At 4:30 p.m., there will be a Review of the Troops at Liberty Plaza. Immediately following this ceremony, former Gov. Nathan Deal will walk out of the State Capitol, shake hands, then Deal will get into a car and depart the capitol area.